Lewiston City Hall is located at 27 Pine Street, Lewiston, ME 04240; phone: 207-513-3000. Photo: Captain Holland House, ca. 1872, 142 College Street, Lewiston, ME. Listed on the National Register of Historic Places in 1985. Photographed by User:John Phelan (own work), 2013, [cc-by-3.0 (creativecommons.org/licenses/by/3.0)], via Wikimedia Commons, accessed March, 2014. Lewiston lies along the Androscoggin River opposite Auburn and, together, form the Lewiston-Auburn Metropolitan Statistical Area. In 1768 the Pejepscot Proprietors, a Boston-based land company, granted to Jonathan Bagley and Moses Little of Newbury, Massachusetts, land on the east side of the Androscoggin River at Twenty-Mile Falls. They were to settle 50 families there and to build a road to connect with the road from Topsham. The place was named "Lewistown," apparently in honor of Job Lewis, a Boston merchant and one-time proprietor. The first white settlers were Paul Hildreth and his family in 1770. His log cabin was a short distance below the falls. Although the cabin burned and the family had to spend the winter in New Gloucester, they returned in the spring. Hildreth operated the first ferry about half a mile below the falls. Several families follow. By the first census in 1790, Lewiston's population was 532. The residents sought incorporation as a town and received their charter February 18, 1795. Water power was harnessed relatively early, as a dam was built of timber by 1808-1809 and a camp was made. In 1809 Michael Little built a large wooden building with saw, grist, and fulling mills next to the falls. This was burned in 1814 by an arsonist, but new mills soon took its place. The town grew slowly, reaching 1549 inhabitants by 1830. Because most were farmers, the population was widely dispersed. The first bridge was built in 1823, but most of Lewiston Falls Village was on what is now the Auburn side of the river. While there were mills by the falls, what is now downtown Lewiston still was the Harris Farm a few dwellings, and a school house. In 1836 local entrepreneurs, primarily the Little family, organized a company to build dams, canals and mills, but they lacked the capital to achieve their goals. The company became known as the Lewiston Water Power Company in 1848 and was taken over by the Franklin Company in 1857. As late as the 1840's what became Lisbon Street was undeveloped, but the community soon changed. Boston investors, including Benjamin E. Bates, financed the construction of the canal system and several textile mills. Many Irish immigrants were employed in the construction. Bates College was incorporated as the Main State Seminary in 1856. Originally the Parsonfield Academy, Parsonfield, the college was founded by Free Baptists under a charter providing that it should be free from denominational control, yet that education and religion should be connected. 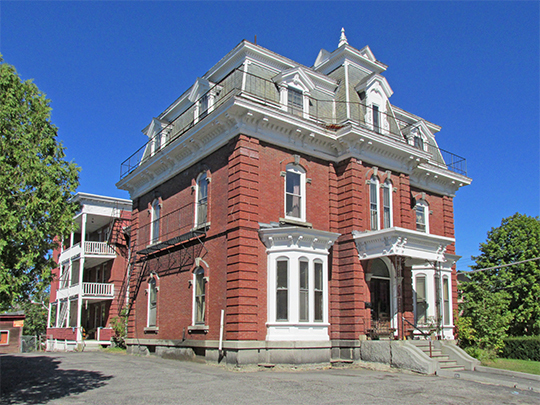 The location of the college was disputed by other towns, but Lewiston's central location and subscriptions by local business men towards the building fund won the distinction. A college course was instituted in 1863 and the seminary's name was changed in honor of Benjamin E. Bates of Boston, who gave $200,000 to the college. Bates was one of the first New England colleges to become co-educational, and in 1907 it became one of the associated colleges of the Carnegie Foundation for the Advancement of Teaching. City of Lewiston Maine, Comprehensive Plan, 1997, www.ci.lewiston.me.us, accessed April, 2011.